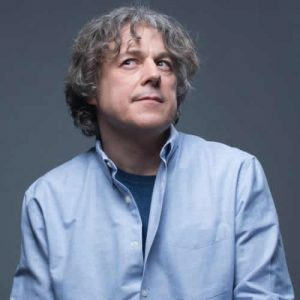 Alan Davies was driven from an early age to do one of two things; either nothing; or the opposite of what his father wanted. Fortunately, for him these two usually coincided, that is until the autumn of 1988 when, after graduating in Drama from Kent University and considering the life of an actor, i.e. unemployment, Alan had to amend the former to next-to-nothing, as he had discovered stand-up comedy. Exposure’, in the summer of 1989 as Alan Balgonie (a name taken from the road he was born in), was a family hit. Quickly reverting to his real name, he set off on a three month trip across Canada performing at fringe festivals and comedy clubs in Winnipeg, Edmonton, Vancouver and Victoria. The stress and strains of performing for an hour to a room full of bemused Canadians did anything but arrest his development, and on his return, he was good … within two years he was Time Out’s ‘Best Young Comic 1991’. He worked in Australia, America and Canada again, before appearances on ‘Tonight with Jonathan Ross’. Numerous other bits of television meant that by the end of 1992 quite a few people knew who he was, and some of his friends stopped ringing because they thought he was famous. Alan has been invading our living rooms again more recently as team leader on the BBC advertising quiz show ‘Best Show In The World . . . Probably’ and with his hit series ‘Jonathan Creek’. Alan is now without doubt one of the hottest properties in comedy today.